The Rebel Sweetheart. : The Genius That is Online Shopping. The Genius That is Online Shopping. 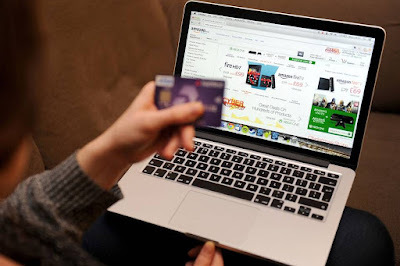 Not too long ago, most people were wary about using the Internet for making purchases. Today, shopping online with places like Peak Boutique is the norm as more people are appreciating the benefits of shopping online. Understanding why online fashion is becoming more attractive is fairly easy. Considering that many people spend a considerable amount of time at work, running to a crowded mall might not be their first desirable place to be. So to accommodate shoppers, fashion stores are putting up show all over the web. Here are more things to consider as you feel secure enough to use your credit card online to buy that favorite outfit or latest fashion trend. Photo credit: Wall Street Journal. After a long hard day at work, you might decide to go shopping at midnight. However, all the stores are closed. What can you do? Wait until the weekend and join all the other shoppers looking for parking spaces on the mall parking lot? Perhaps. Or, you can boot up your computer and go shopping at one of your favorite online stores. That is the genius of shopping online. You can conveniently buy what you want or need at any time of the day or night. Of course, your order might not be processed until the next day when workers are awake. Still, there is a good chance that your items will arrive within a few days. Offline, you might have to go to several stores within one or several malls before you find the perfect shade of red. On the Internet, however, you can research different shops with just a few clicks. You can also read reviews about the store and/or items that you are considering before you spend any money. You save time, money and the disappointment of driving all over the city in hopes of finding what you want. More often than not, you can find better bargains online than walking into a shop. Online stores usually have a great deal of competition to win over customers. As a result, you get better deals online. Indeed, online shopping growth has even sparked high end fashion brands to vie for customers. They too offer discounts and sales regularly to build and sustain a fan base of customers who enjoy the convenience of shopping online. This hassle-free way of buying without leaving your house will continue its evolution. I do not mind shopping online for certain things, but I LOVE to go into the store and check out things in person. I like to feel the material of a top or an outfit for my granddaughter before I buy it. Or I want to see what it looks like before buying it because I know they do not put the real pics online at times. No doubt that online shopping has changed the world views shopping in general! I love it and I'm quite sure I'm also slightly addicted to it. I love online shopping! It's really convenient especially for people who work at home or for moms who can't go out all the time. It's definitely something that I take advantage of. Seoul Searching | Exploring Insadong. Seoul Searching | Lotte World Mall.